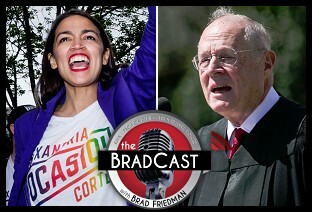 " EARTHQUAKES: JUSTICE KENNEDY RETIRES, NY PROGRESSIVE UNSEATS TOP HOUSE DEM: 'BradCast' 6/27/2018	"
« PREVIOUS STORY "Stolen SCOTUS Approves Trump's Muslim Ban, Strikes Down CA Rules for Anti-Abortion 'Clinics': 'BradCast' 6/26/2018"
"EARTHQUAKES: JUSTICE KENNEDY RETIRES, NY PROGRESSIVE UNSEATS TOP HOUSE DEM: 'BradCast' 6/27/2018"
Merely because the Supreme Court has declared that crimes against us are "constitutional", it does not mean those crimes are permissible. It is up to us to prevent their permissibility. As a citizen of Mark Pocan's 2nd Congressional District in Wisconsin, I think I may be in a good position to comment. Mark Pocan IS not a liberal darling. In the runup to the Democratic nomination for president in 2016. Pocan was a superdelegate who voted for Clinton despite Sanders winning the vote everywhere except Milwaukee. Later, when it came to voting for Minority Leader of the House, he voted for Nancy Pelosi instead of bringing the Democratic Party into the 21st century. As a result, although I supported his initial bid to represent the district in Congress after Baldwin left that seat to run for Senate, I no longer consider him Progressive and no longer help get signatures for him, put up a yard sign or anything. I would support a reasonable alternative now although the initial contest was probably when that should have happened.